It's that time of year again, where we all panic about the coming cold and pressure ourselves to have as much warm weather fun as humanly possible while we still can. This is not something we ever have to force on the boys. They will be wild and weird anytime, especially when it's raining on them. They were supposedly dancing, but instead arrived at whatever intersection is home to a mosh pit plus interpretative art no one understands, especially those who pretend to. Or maybe this is a rain dance? I really couldn't say. Adelaide and I have engaged in somewhat more civilized behavior. Eating ice cream being what constitutes civilized behavior in this family. Aaaaand then she saw I was taking her picture, and was thrilled. When she gives me this look I yell things like, "Adelaide, what are you wearing?" just to complete the paparazzo feel of the situation. Even though there are beautiful temperatures outside right now and I feel that autumn-pressure to enjoy every last outdoor activity until it is in fact robbed of all pleasantry, I sometimes need a little rest from such breakneck fun. Currently I'm doing this by watching Stranger Things on Netflix. If 80's nostalgia is your thing, this show will be like crack to you. The 1980's were my years of early childhood, so each episode basically involves constant memory whiplash, uncovering all these memories I'd previously completely forgotten, from hairstyles to telephones to the entire feel of the show. 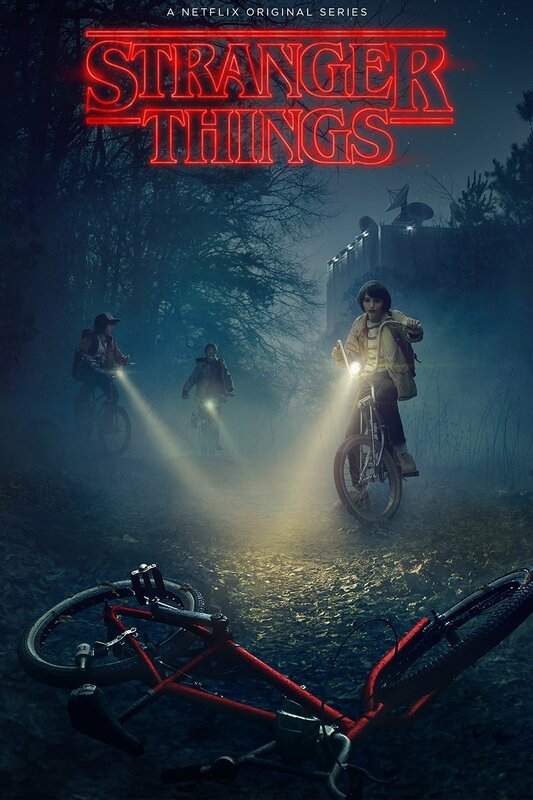 I can only think the Duffer Brothers invented a time machine and for some bizarre reason used it to go back to the 80's and film a television show. Even that part of the show that you usually skip over, there at the beginning where it's basically reminding you, "Hey, in case you've forgotten that decision you made 90 seconds ago, here's the name of the show you're watching," with clips of the actors laughing or glaring disapprovingly or whatever along with the title of the show [here is where Derek should swoop in and supply me with the name of whatever that thing is called, but no, he's not here and instead I've had to write all these words to explain a practice I find ridiculous anyway], well that thing that I normally find outrageously annoying- with Stranger Things? I like theirs. I never skip it or feel suddenly compelled to get a snack, no: I watch it every time, start to finish. Here's the thing, though: I am a scaredy cat. Seriously a-feared of everyone and everything when it comes to tv and movies (and books and, you know, life), so I can't just watch this show; it is way too scary and jumpy for the yellow likes of me. So instead I have to multi-task, something I'm normally terrible at doing, but seriously, more than 80% of my attention focused on the television at any one time is bad news. I have a very sensitive sympathetic nervous system, okay? I love how your kids approach life. I am also a scaredy cat on watching scary TV or reading scary books. My husband likes to watch "Blue Bloods" (TV show on netflix about NYC cops, with Tom Selleck - slanted in favor of cops, for sure, but a pretty good drama). The first part of the show is the bloody part with the crime, so I let him watch the first 3 minutes, and then he tells me what happened and I can watch the rest. Husbands are useful that way.